The new constitution has established the office of the president of the Republic. 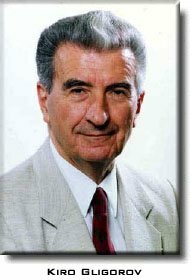 Elected in January 1991, Mr. Kiro Gligorov was the first president of the Republic of Macedonia in the full sense of the world in the political and constitutional history of Macedonia. 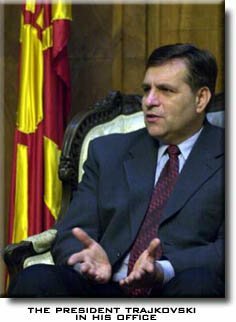 Elected in December 1999 Boris Trajkovski is the second president of Macedonia. The president of the Republic is elected in general and direct elections, by secret ballot, for a term of five years. A person may be elected President of the Republic of Macedonia two times at most. A person may be elected president of the Republic of Macedonia if aged over 40 on the day of election and if he/she has been a resident of the country for at least ten years. A candidate for the president of the Republic can be nominated by a minimum of 10.000 voters at least 30 representatives. A candidate is elected President if voted by a majority of the total number of voters. If no candidate wins an overall majority, the two most leading candidates enter a second round and the candidate is elected President who wins a majority of the voters of those who voted, provided that more than half of the registered voters voted. If in the second round of no candidate wins the required the majority of votes, the whole electoral voting procedure is repeated. The same applies in the event of only one candidate being nominated for this post, but, of course, after the first round. A novelty in the proposed draft for the election of President of the Republic is that the costs of of the presidential election campaign cannot exceed 1.000 average monthly salaries over the last three before the elections. The duty of the president of the Republic is incompatible with the performance of any other public office, profession or appointment in a political party. In case of death, resignation, permanent inability to perform his/her duties, or in case of termination of the mandate in accordance with the provisions of the Constitution, the office of the President of the Republic is carried out by the President of the Assembly until the election of the new president. Should the president of the Republic be temporary unable to perform his/her duties, the President of the Assembly deputizes for him/her. grants pardons in accordance with the law, and performs other duties determined by the Constitution. Relations between the Assembly and the President of the Republic of Macedonia and based on the principle of division and powers. "The president of the Republic addresses the Assembly on issues within his/her sphere of competence at least once a year." "The Assembly may request the president of the republic to state an opinion on issues within his/her sphere of competence." The President of the Republic exercises his/her rights and duties on the basis and within framework of the Constitution and the law. The procedure for determining the President's answerability is initiated by the Assembly with-thirds majority vote of al representatives. It is the Constitutional Court that rules on the answerability of the President by a two-thirds majority of the vote of all constitutional judges. As can be seen from the areas of competence, the office of the President of the Republic of Macedonia is not typically representative. Conceptually, and according to the experience to date, it is part of the executive power. There is no doubt that the President has large and important constitutional competencies, but they are far from superseding the Assembly and the Government in the exercise of their functions. We must bear in mind the present political composition of Macedonia and particularly the situation in the Assembly where is possible that an almost "ideal blockade" may be created which is automatically reflected in the functioning of the government. Hence it is essential to the vital interest of the citizens and the state that the office of the President of the Republic may be exercised to its full capacity. The fulfillment of the function of the President of the Republic in this period has mostly involved activities promoting the full establishment of Macedonia as a subject of international law, its sovereignty and political position. The sphere of foreign policy and its creation within the constitutional competencies between the legislative and executive powers, and between the president of the Republic and the Government as proponents of the executive power, has proved to be an area which lies mostly in the field of responsibilities and activities of the President of the Republic. The moderateness and realism characterizing Macedonian foreign policy have led to the country's unanimous admission to the United Nations Organization in spite of all obstacles and difficulties. The foreign policy platform was explicitly presented by the President Kiro Gligorov in his address to the Macedonian Assembly in February 1993 informing it of the activities concerning Macedonia's international recognition, and in his address to the UN General Assembly on April 8, 1993, on the occasion of the country's admission to the UN. This platform has been constantly elucidated and reaffirmed in the President's meetings with many heads of state around the world and during the talks and contacts with the truly imposing number of foreign statesmen and delegations coming to Macedonia. President's Kiro Gligorov address of December 30, 1993, in accordance with the constitutional right of the President to address the Assembly, could be described that the head of the state submits a report to the nation. The immediate reason then was the adoption of the programme of Economic Stabilization. The address demonstrates that with the the completion of the process of Macedonia's international recognition and stabilization, the function of the President's of the Republic will become more and more significant in home policy as well. There are three key areas: swifter advancement towards a market economy, further development of the rule of law and civil society, and stable inter-ethnic relations. This may imply a greater involvement of the President in home policy and also new relations with the Assembly and the Government. This will at the same time have increasingly simulative and integrative dimensions. It is possible to conclude that, in the new framework of relations, interactions and communications between section of the government and basic economic, social and political proponents, the presidential function will be increasingly seen as a guarantor of the country's stability. One of the most important preconditions for this is the creation of a social and political atmosphere of harmonius inter-ethnic relations. This is generally connected with the development of human rights and freedoms, the rule of law and civil society, and the policy that Macedonia is the homeland of all the people living there. Macedonia has opted for the highest standards of human and ethnic rights, but the nationalities also have responsibilities towards their state. The constitutional functions and responsibilities of the President in this sphere, too, within the aforementioned stimulative and and integrative dimension, will continue to have a strong influence on the development of dialogue, understanding and implementation of political means within the system and its institutions and the process of harmonization of inter-ethnic relations.